Prime Minister Pedro Sánchez was caught between the fury of right-wing opposition parties and even the anger of top members of his Socialist (PSOE) party after he made the concession to the Catalans. The right-wing People’s Party (PP) leader Casado labelled Sánchez an ‘illegitimate prime minister’, the ‘biggest felon in Spain’s democratic history’ and accused him of ‘high treason’. The controversy comes just days before the highly sensitive trial of 12 Catalan leaders begins and as Sánchez tries to pass his 2019 budget, for which he needs the support of Catalan pro-independence lawmakers in the national parliament. It centres on a decision by Sánchez to accept the presence – as asked by Catalan pro-independence parties – of a neutral ‘rapporteur’ in future talks between parties in the northeastern Spanish region. These talks will take place in parallel with negotiations between the central and Catalan governments as Sánchez tries to ease a secession crisis that came to a head in October 2017 when separatists made a short-lived declaration of independence. The seemingly minor concession has caused a furore as critics accuse Sánchez’s socialist government of yielding to the ‘blackmail’ of separatists in order to get the budget approved and maintain his hold on power. No matter. The People’s Party (PP), centre-right Ciudadanos (Cs) and far-right Vox, which has only recently burst onto Spain’s political scene, have all called on their supporters to take to the streets of Madrid on Sunday against Sánchez. 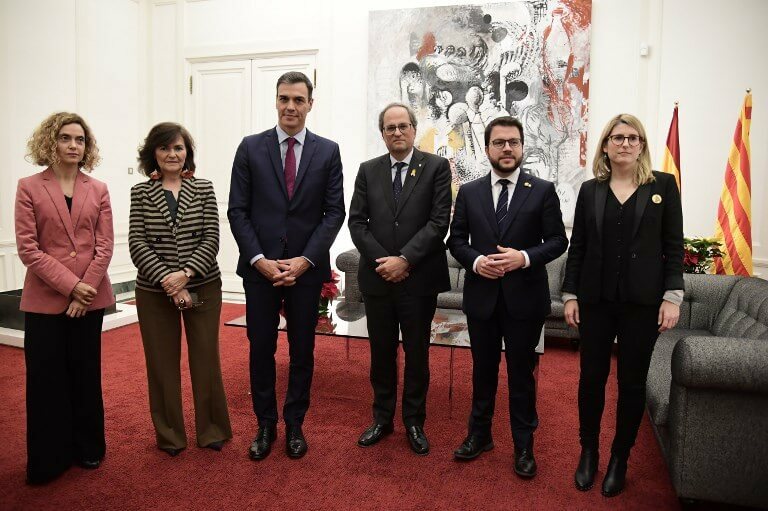 The three-way show of force comes after the PP and Cs formed a regional government coalition in southern Andalusia following December elections with the support of Vox. ‘The government made a miscalculation,’ says Fernando Vallespin, a political scientist at the Autonomous University of Madrid. ‘It thought it could convince people that this (rapporteur) figure was harmless (but) it is clear that it’s an unacceptable concession that crosses a red line’ for Sánchez’s critics, he added. But his strategy has even caused discontent within his own party as top-level officials, who have criticised him in the past, voice their unease at making concessions to Catalan leaders who are dead set on breaking away from Spain. The discontent comes just months before municipal and regional elections on 26 May. ‘Approving a budget doesn’t justify concessions that call into question the constitution, Spain’s unity, the rule of law or decency,’ said Javier Lamban, the Socialist president of the northeastern region of Aragon. So far, pro-independence lawmakers in the national parliament are refusing to approve Sánchez’s budget, even if they helped him come to power in June by voting for a no-confidence motion against then conservative prime minister Mariano Rajoy. And Sánchez’s concession on the ‘rapporteur’ has not swayed them yet. ‘There is still a lot of work to do’ before that can happen, Catalan government spokeswoman Elsa Artadi said Thursday.